This entry was posted in General Musings and tagged chicken, Grill, Spices, spicy on June 30, 2009 by Lauren. This reading group began meeting at Motte & Bailey in July of 2009, reading books about any aspect of culinary history. Books for the next meeting are determined at the end of each meeting, and members are encouraged to bring books to suggest or simply to show before the meeting. We meet the 3rd Wednesday of each month. This entry was posted in General Musings on June 30, 2009 by Lauren. This entry was posted in General Musings and tagged baked goods, cookies, dessert on June 30, 2009 by Lauren. This entry was posted in General Musings and tagged beef, comfort, Grill, hot dogs, Ypsi on June 30, 2009 by Lauren. This entry was posted in General Musings and tagged chocolate on June 29, 2009 by Lauren. This entry was posted in General Musings and tagged breakfast, eggs, healthy, Mexican, spicy on June 29, 2009 by Lauren. This entry was posted in General Musings and tagged local, market on June 27, 2009 by Lauren. I got this recipe on Bakespace from user idreamofdessert, who got it from the Barefoot Contessa Ina Garten. I added a bit of color to mine with some fresh raspberries. The cupcakes were dense but flavorful and sweet. This entry was posted in General Musings and tagged baked goods, cake, cupcakes, dessert, fruit, sweet on June 24, 2009 by Lauren. Lately I’ve been making my own granola bars. I blame Whole Foods for this development; I got the inspiration while looking through the snack recipes on their website and found one for chocolate chip granola bars. It looked pretty simple (it IS pretty simple) and besides, I love granola bars but often they make me sick. I tend to have bouts of reactive hypoglycemia fairly often and commercial granola bars are usually full of sugar and corn syrup which is a bad thing for me to have, and natural store-bought granola bars are pretty expensive. So I thought, why not? I’ll make my own. It’ll be like the culinary equivalent of cutting down your own trees for wood. Or something like that. This entry was posted in General Musings and tagged baked goods, bars, healthy, snacks on June 24, 2009 by Lauren. This entry was posted in General Musings and tagged chicken, french, fruit, Grill, vegetables on June 23, 2009 by Lauren. Every family has their favorite dishes, things that appear at every get-together and every holiday. My family has baked macaroni and cheese. We’re connosieurs of it, really. Don’t get me wrong; deep down, the poor kid in me still loves something about Kraft easy mac, and the grown-up in me still likes to experiment with my own homemade version of the stuff, but really, truly and absolutely there is no substitute for a good, hearty backed macaroni and cheese casserole with tons of gooey cheese and a good crispy crust. This is the version I make. I got it from Tyler Florence (the man is a god amongst mortal chefs) and I make it with or without the bacon (depends on whether my vegetarian mom is partaking) altho Josh will say that it’s not the same without bacon. It’s a pretty easy recipe to scale, and I’ve made it for as many as 25-30 people. It always gets rave reviews. This entry was posted in General Musings and tagged baked goods, cheese, comfort, pasta on June 23, 2009 by Lauren. As of early yesterday afternoon, I’d had no real plan for dinner. I’d bought some beef stirfry meat at Busch’s earlier, intending on putting something together for lunches during the week, but had nothing specific in mind. By late afternoon, though, I’d slowly started putting some pieces together. I had stirfry meat, ok. I had pasta, several varieties. I had spinach leftover from our farm share, and garlic scapes. A search of the freezer revealed some shelled edamame. And then I was sitting on the couch looking out at my deck when I realized my basil plant was getting rather tall and needed to be cut down….pesto! So things all just sort of came together. This entry was posted in General Musings and tagged beef, pasta, Stirfry on June 22, 2009 by Lauren. When I was a kid I had, for some unknown reason, a total love of all things Moroccan. Now, I’ve never been to Morocco (although I’d love to go some day), didn’t know anyone from Morocco, had absolutely no connection to the place whatsoever. But it intrigued me, and still does to this day. So I love finding Moroccan recipes. I was particularly excited to see this one, while watching Tyler Florence’s show on Food Network. I love Tyler Florence. I really do. But I’ll wax poetic about that in another post later. Anyway, he was making Moroccan brick chicken with yogurt sauce and couscous and it looked, as all his food does, absolutely divine so I thought I would try it sometime. This entry was posted in General Musings and tagged chicken, Grill, Moroccan, Spices on June 18, 2009 by Lauren. These little beauties are delicious and easy to make. 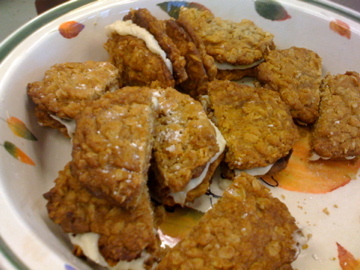 They are my favorite homemade cookie sandwich…so far. This entry was posted in General Musings on June 17, 2009 by Lauren. I might be slightly obsessed. Some women collect shoes and purses, and other women collect boyfriends or, if you’re Angelina Jolie, babies. Me, I collect recipes. Recipes and various information about food. I have around 30 cookbooks and hundreds of recipes stored away inside my computer, and I spend my “leisure reading” time on books about the history of salt, the evolution of modern Spanish cuisine and the anthropology of chocolate. When I’m not reading about food, I’m probably thinking about food, or planning food, or eating food. My friends know about my obsession, but they let it go, because it’s delicious. If only all addictions were as delicious and fruitful as mine. Get it–fruitful?